Spectra: A spectrum obtained by M. Fujii (Fujii Kurosaki Observatory, Kurashiki, Okayama, Japan) on 2015 Mar 30.758 UT is consistent with PNV J17291350-1846120 being a He/N type nova, and may be seen at http://otobs.org/FBO/fko/nova/pnv_j17291350-1846120_20150330.png. A spectrum by K. Ayani (Bisei Astronomical Observatory, Ibara, Okayama, Japan) on Mar. 30.8 UT confirmed Fujii's findings including N III and O I emission; it may be seen at http://tinyurl.com/kbpoyv6 (CBET 4086). Observing recommendations: Observations of all types (visual, CCD, DSLR, spectroscopy) are strongly encouraged as this nova evolves. Charts: Charts for Nova Oph 2015 may be created using the AAVSO Variable Star Plotter (VSP) at http://www.aavso.org/vsp. Submit observations: Please submit observations to the AAVSO International Database using the name NOVA OPH 2015. Once a GCVS name has been assigned, please use that name. 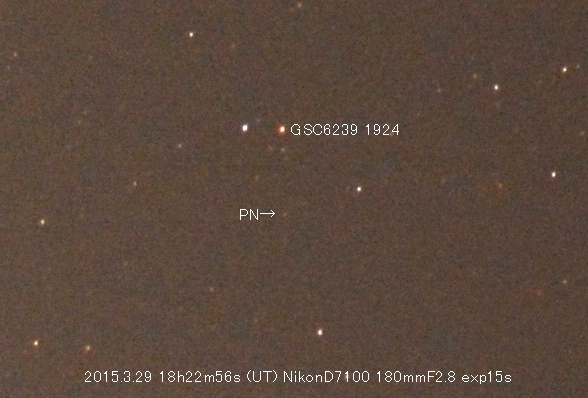 b. Sakurai reports nothing was visible at this location on two frames taken on March 28.766 UT. 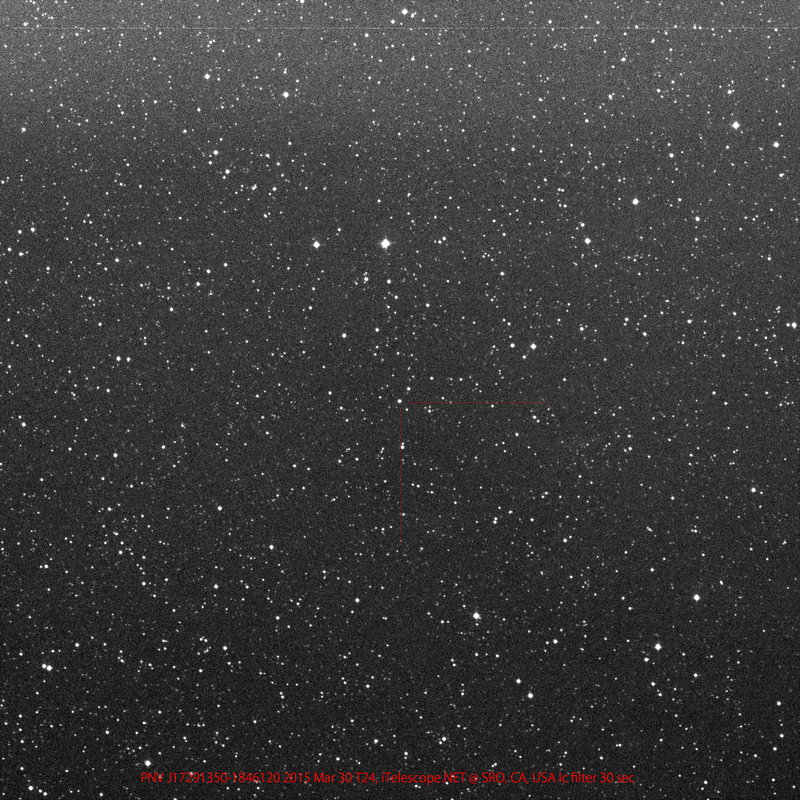 S. Kiyota (Kamagaya, Japan) confirmed the object's presence on an image obtained 2015 March 30.540 remotely with 0.61-m f/6.5 CDK astrograph + FLI PL09000 CCD camera at Sierra Remote Observatory site of iTelescope.NET (Auberry, CA, USA). c. P. Schmeer (Bischmisheim, Germany) notes a star magnitude ~18 in the USNO-B1.0 catalogue at position end figures 13.58s, 13.7". - S. Kiyota (Kamagaya, Japan), 13.42s, 13.85"
- T. Noguchi (Chiba-ken, Japan), 13.42s, 13.9"
Congratulations to Yukio Sakurai on his latest discovery!